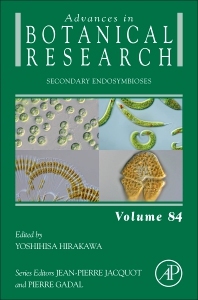 Secondary Endosymbioses, Volume 84, the latest release in the Advances in Botanical Research series, summarizes eight major groups possessing complex plastids, including heterokonts, dinoflagellates, apicomplexans, chromerids, haptophytes, cryptophytes, euglenophytes and chlorarachniophytes. Updates to this new volume include sections on the Evolution of secondary plastid-bearing organisms, Primary plastids of Archeaplastida, Secondary plastids of heterokonts (diatoms), Secondary and tertiary plastids of dinoflagellates, Apicoplasts, Secondary plastids of chromerids, Secondary Plastids of haptophytes, Secondary Plastids of cryptophytes, Secondary Plastids of euglenids, and Secondary Plastids of chlorarachinophytes. Through an examination on how plastids evolved by multiple endosymbiotic events, this book discusses how diverse and abundant organisms harbor complex plastids. Yoshihisa Hirakawa is an assistant professor at Faculty of Life and Environmental Sciences in the University of Tsukuba (Japan) since 2012. He received his B.S and M.S degrees in Biology from Kanazawa University in 2004 and 2006, respectively. He studied plastid targeting into complex plastids evolved by secondary endosymbioses and received his Ph.D degree in 2009 at the University of Tsukuba, under the supervision of Prof. Ken-ichiro Ishida. After graduating, he did a postdoc in the Keeling lab of the University of British Columbia (Canada) from 2010 to 2012. His main research interest is to understand endosymbiotic evolution of organelles in complex microorganisms. I'm currently working on organelle genomics, organelle division, organelle DNA replication, and organelle protein trafficking using marine unicellular algal groups.